Or at least, I should. Because he loved that car. I taught him how to drive stick on a Ranger a year ago, and he promptly sold his 2014 civic and after testing all the hot hatches ended up with the fiST. It was love at first sight. His first “fun car”, he slowly added little personalizing touches. Those dumb Transformers license plate bolt covers? Check. Seatbelt covers? Those stayed in for a week, tops. Then it was engine mounts, which made a huge difference. Followed by full synthetic oil changes. Most recently—as in less than a month ago—he installed a new exhaust, no longer content with sounding like a Prius coasting downhill in neutral. And then I ruined it. Saturday morning I offered to take him to the forest service roads littering Skykomish, Washington to allow him to let loose a bit. This is where I go to get some hard driving in—and for me at least—it’s a hundred times better than any track. Despite being a decent bit lower than my Miata, he managed to get the fast(ish) Ford over and around obstacles with little difficulty and—dare I say it—a surprising amount of grace. I was in front, partially because I knew the way, and partially because my top was down and I didn’t feel like eating literal dust. We made it to the top of a particularly spectacular peak, and after getting out to take in the scenery, I told him that we were going to try that particular run again, but this time faster. Much faster. As is good and proper, we went up slowly and carefully the first time to assess what kind of shape the trail was in and see how many Jeeps/Subarus/lifted trucks could be potential fatalities around a tight sweeper with little visibility. There was no one. We were the only two people on this particular section, so it was time to turn things up to 11. I led us back down to the base of the mountain, picking up the pace, but not getting too crazy yet. I didn’t want to leave him behind. Bare as they may be, my summer tires were still doing a fantastic job of shooting rocks back a good twenty feet, and so my friend was forced to tread a careful line, staying close enough to not get lost, but far back enough to keep his windshield relatively intact. We made it back down. I could tell my friend was pumped. He was craving a bit more speed, a bit more adrenaline. This is where I did one of the stupidest things of my life. I offered to teach him how to drift my car. A car he’s wholly unfamiliar with, on narrow dirt roads with dropoffs a hundred feet down or more. Of course, he said yes. Thinking about the best location to do this safely, I decided we’d start with something a bit easier than drifting. Donuts! Simple enough. We drove to a moderately safe clearing about halfway up the mountain and I told him to hop in the passenger cubby—there was only a driver seat today—and watch everything I did. Listen to everything I say. Ingrain my movements into your mind. I told him that from a complete stop, we wanted to do a few things in a very particular order. Foot on the throttle, keeping revs at 5k. Drop the clutch, keeping the wheel at full lock, and revs high. Modulate the back end sweep with throttle. Give it more gas to kick the back end around further, thus tightening your curve. Less gas will straighten you out slightly, which increases the size of your circle. Minor steering adjustments can be made to guide the front end, or major adjustments to switch from counterclockwise rotation to clockwise rotation mid spin. And lastly, feathering the clutch will allow you to break traction again assuming you slow down too much and the rear tires start to bite. It’s a lot to take in for someone who’s never experienced it, but as most of you know, it’d pretty simple. All those words up there become instinct, and pretty soon getting sideways is as easy as... Well. Not getting sideways. After a few examples, I let him jump in the drivers seat, laying myself down in the passenger cubby. His sticking point was throttle application. At first he would let off the gas when coming off the clutch, but once you have pointed that out he picked the rest u pretty quickly. I had him drive in circles and initiate spins with a quick clutch kick, get the backend loose with some left foot braking and again, practice donuts until we were both coated in dust. The joy I saw from those twenty minutes was as close to the a religious experience as I think I’ll ever witness. He was hooked, completely. He looked over at the forgotten Fiesta parked on the side of the cliff, his smile darkening for a fraction of a second. Then it was back to the hooning. I had him get back in the passenger side, and I showed him some real drifting. Chaining uphill sweepers back to back. So much rotation that if we had been gunning for a finish line, the rear wheels would have crossed first. It was a magical day. Fast forward to hours later, I’m getting Craigslist listings sent my way every minute. 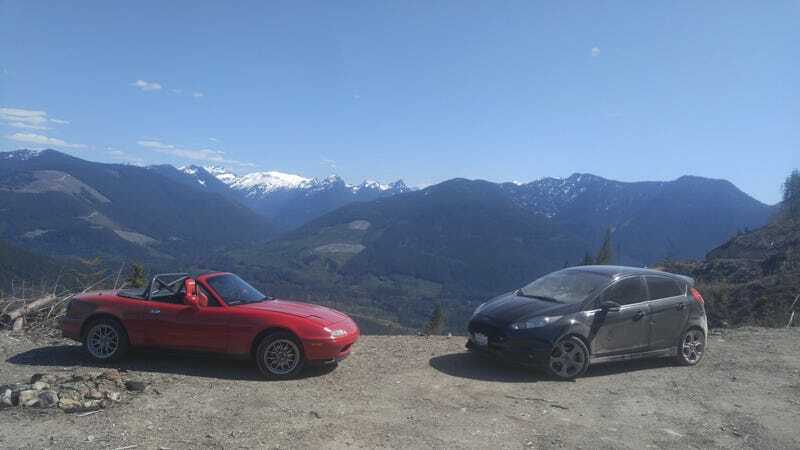 From a Porsche 944 to a G37 I’ve been going over the pros and cons of each platform with a man who is incurably addicted to Rwd. I ruined my Friend’s Fiesta ST, at least for him. But you’ll get no apologies.